Patrick Bateson FRS is the co-author of Play, Playfulness, Creativity and Innovation (2013), Plasticity, Robustness, Development and Evolution (2011) and Measuring Behaviour (3rd edition, 2013). 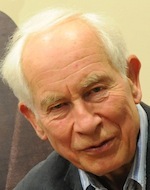 He is Emeritus Professor of Ethology at the University of Cambridge. He is President of the Zoological Society of London and former Biological Secretary and Vice-President of the Royal Society. He has a long-standing interest in behavioural development and in evolutionary theory.